No question….this has to be the most lopsided battle. Nothing will ever compare to or beat a Reese’s….ever….never ever, period. For me, Reeces have too much PB and the PB is way too strong, so I would probably go with the Boyers. Reese’s…the best are the special “holiday” types, such as eggs, pumpkins, and trees! Reese’s are filled with that gritty, sugary stuff, not peanut butter. Give me a Boyer’s any day. Reese’s are classic. Boyer’s candy is seriously second rate, especially their chocolate. I recently did a comparison of Valomilk and Boyer’s Mallo Cups on my site, and there was just no comparison: Valomilk is great, Mallo Cups just taste cheap and nasty. How did that ‘c’ sneak into the poll? Must have been that awful Boyer at work! Reese’s is one of the most beloved chocolates around (along with Kit Kat). I don’t know a single person who doesn’t like them. Who the heck is voting for Boyers? No other peanut butter cup comes close to a Reese’s. Everyone else should just give up. I don’t like Reese’s chocolate. It’s pretty bad. Haven’t seen a new submission. Hope everything is ok! I second Devo K. Hope all is well. Miss the snacks! GREAT NEWS FOR THOSE WHO HAVE OR WHOSE LOVED ONES HAVE A TREE-NUT or PEANUT ALLERGY!!! Peanut-Free Planet NOW SELLS (!!!) “SUNBUTTER CUPS”!!! (Made by the Seth Ellis Chocolate (or Candy) Company. They are SO GOOD!!! – I developed Tree-Nut and Peanut allergies while in my late twenties, and had to go for YEARS without MY REESES!!! (Esp. hard at Halloween! I miss this blog!! 🙂 I know your busy though!! what happened? no more posts? This isn’t because of the whole Geocities thing, is it? I used to buy Boyers back in the 50’s when I was in Junior High. They were good then, and they had the play money coupons inside. I have never tasted a Boyer product. I have eaten many Reese’s pb cups! One of the best tasting chocolate candies ever created. I hate Reese’s. To me they taste like sugary salt and not peanut butter. But then again, I don’t like candy much anyway, haha. Wow. Never had a Boyer’s PB cup but they’re hard to find, but right now i’m eating a mallo cup. Reese’s always tastes good, I wish they had a version of a mallow cup. Anywho. the thing that surprises me about this blog post is the all the candy haters giving their 2 cents on this issue. Frankly this firmly goes under “Abuse of the 1st ammendment/Free Speech.” whatever happened to common courtesy> i’m talking to you Alan and Annette. really keep your opinions to yourselves. that’s one of the downfalls of the internet. haters trolls and idiots that don’t like the subject at hand always ramming their $20 dollars worth of opinions in people’s faces, as if they feel that they Have the superior mindset because they HATE. BOYER ALL THE WAY!!! Reese’s is so greasy, the chocolate bends! Chocolate is not suppose to bend, it should crack. Also, Boyer is still MADE THE THE USA! Not like “el Resso’s” which are proudly made in Mexico. I got some cosco brand peanut butter mini cups for xmas and thought they were going to be a let down, but they’re actually pretty good. I might like them better than reward even, as the peanut butter is much creamier and I really like that. Boyer taste better then Reeses, they are not made in the USA, and they dont use cocoa butter either they use a chemical as a replacement. I agree with the Boyer fans here. I prefer them over the greasy Reeses. And if you ever had their Butterscotch Peanut Butter cups, you’ll toss the Reeses aside in a heart beat! Notice the mutual colours — orange, yellow and brown. NOTE: the orange on the Reese’s package is trademarked. 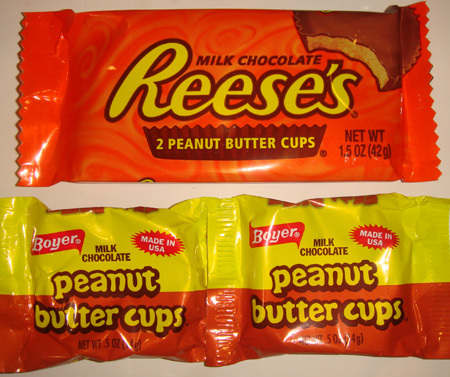 Boyer predated Reeses by decades. They were famous for their vanilla drop candies and introduced peanut butter. Reeses taste tested and came up with theirs. Don’t know if there were patent issues involved. Am in Canada.I have been eating Reese’s peanut butter cups since the 1960’s,not everyday,but; it was my choice.Bought some in Canada,a few years ago…..called the 1-800 number…..it tasted rancid.I asked where they were made,…then they asked for the code at the bottom- they did an about turn-no! They are made in Mexico.That did it.They had a very rancid taste.Never bought one since.They were disgusting.Funny how things change over the years- cheap product.Maybe they should clean the machines once or twice a month.